The IBMA Foundation hosts teacher workshops each year with the goal of introducing bluegrass music to classroom and music teachers at all levels (including home schooling parents), by giving them practical lesson plans and tools to implement bluegrass music in the classroom. 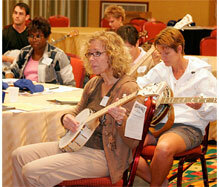 The courses, with attendance certificates issued for professional development credit, usually include live presentations by professional bands who demonstrate the instruments used and vocal harmony structure, lesson plans on the history and evolution of bluegrass music with hands-on projects and activities for students, and live presentations from student bands with advice from educators who are already using bluegrass successfully in their schools and camps. A number of bluegrass music resources and take-home handouts, including info from IBMA Foundation’s Discover Bluegrass: Exploring American Roots Music DVD and accompanying lesson plans, are shared with teachers, along with a free one-day festival pass to the event going on during the teacher workshop.